SPAS - Acoustic processor system of sonobuoys for anti-submarine warfare (ASW). SPAS is an acoustic sonobuoy processor for detecting, locating and tracking underwater threats from aerial platforms. It incorporates the most advanced acoustic processing techniques for all types of passive and active sonobuoys, implemented analogically and digitally. It can be adapted to the specific needs of each platform and mission. The SPAS sonobuoy acoustic processor is a system where its architecture has been specifically designed to give it maximum versatility. Its software and hardware are easily customizable to meet the specific requirements demanded by the user or integrator, such as the platforms on which it will be installed, operational concept and number and type of sonobuoy for processing. Acoustic processor designed to meet mission objectives. The SPAS Acoustic Processor incorporates automatic contact detection and advanced signal processing technologies that reduce operator workload. In addition, it has been designed in close collaboration with acoustic operators, incorporating tools to increase the efficiency of the ASW mission. Multistatic for effective follow-up of the contact. Once the threat is located, SPAS includes powerful localization tools – including multistatic processing and energy plotting to enable threat tracking. These tools indicate the direction and speed of the contact for planning and executing the correct deployment of the sonobuoys. Acoustic sensor operator training, the key to mission success. The operator’s operational skills are critical to the effective location and tracking of threats. As a result, the SPAS acoustic processor offers the possibility for the operator to receive on-board training by simulating complex acoustic contacts and scenarios in real-time without the need to launch real sonobuoys. Acoustic processor for all types of sonobuoys, including Ambient Noise Measurement (AMM) and Bathythermal (BATHY). Up to 64 passive and active sonobuoys implemented analogically or digitally. Proprietary algorithms for effective detection, acoustic analysis, localization and tracking of contacts. Performance prediction tool is included to calculate the best configuration for launching sonobuoys. Acoustic Classification System (SICLA) is included. Automatic Alert Function (AAF) for warning to the acoustic operator “when” and “where” the threats have been detected. Recording and playing in several speeds in accordance with STANAG 4283. 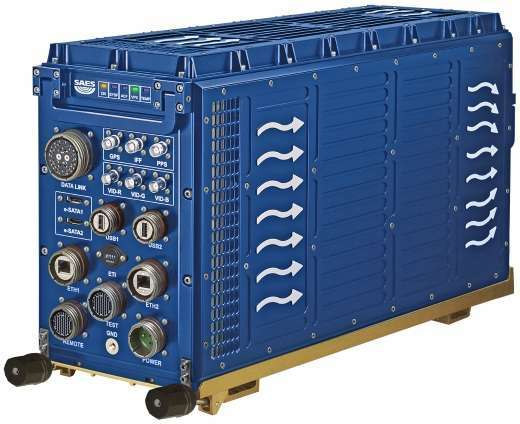 Sistema FTAS: for analyzing the acoustic and tactical data recorded during the ASW mission (STANAG 4283 Ed. 5). Sistema TAT: for training of the acoustic operators.